The three-axes impact data logger PCE-VDL measures both impact and vibrations and it is a compact data logger for G force with a high resolution. The device is powered by batteries. 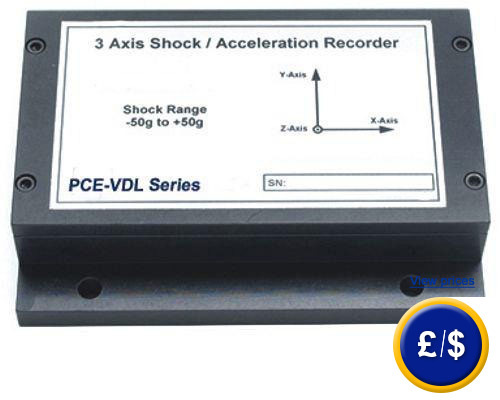 Due to a self-explanatory software the three-axis impact data logger PCE-VDL can easily be programmed for automatic registration of three-axis impact signals up to 500 g. The data logger PCE-VDL is able to measure and record G force as the peak acceleration during a period of time predefined by the user. Measurement values are stored in non-volatile memory (349,525 measurement values in each axis). These values are available even after energy loss. Its housing is made of aluminium, so this instrument can be used under rough conditions. Due to its flexible adjustment and its compact housing the data logger PCE-VDL can be used in the transport control of goods and valuable machinery. By means of the software, measurement values can be read, stored and used for the data logger programming. The measurement quota can be adjusted (from 64 values per second up to one value every 5 minutes in the impact mode) to operate the data logger. At the following link you can find the data logger that best suits your needs. the data logger of G force. Data logger of G force. Operating Conditions -20 ... +60 ºC/0 ... 95% H.r. The projection and reading software can be used by inexperienced personnel. The user can select the measurement quota very easily and start with the measurement when the data logger is connected to a PC. Zoom function: With the mouse you will be able to increase or reduce the graphic easily. Statistics: maximum, minimum and average values, variations, etc. Real time operation: Presentation of measurement values in real time when values are simultaneously stored in your PC. Printing: Values can be printed as a chart or as a graph. User password: It can be programmed by means of the software or in the data logger itself to avoid entering without permission. Automatic scale: The automatic scale can be activated or deactivated. 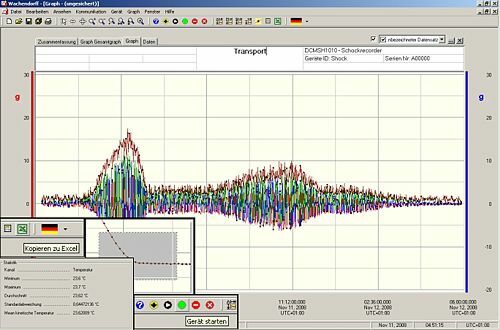 Calibration: Automatic calibration in the software and storage of parameters in the data logger. Every physical unit (up to 10 signs) can be programmed through the software and this is stored in the instrument. 1 x Data logger PCE-VDL for G force (depending on the model), 1 x battery and user manual. 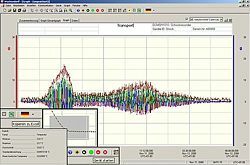 Software for programming the device, for reading and recording measurement values in the data logger. The software kit comes with an interface cable and CD. Additional functions: real time registration, statistical function and data exportation to MS Excel.